Weather, the most recent barrier to the annual Ride for the Pass cycling event, decided to cooperate Saturday — except for a quick dash of light snow for the fastest riders. 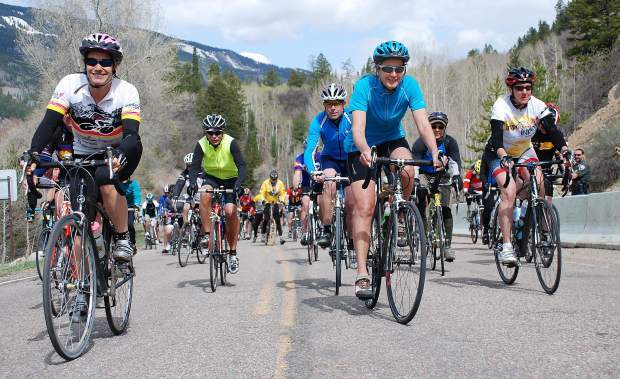 But most of the 300 cyclists participated in the annual benefit for the Independence Pass Foundation under partly cloudy skies, with pleasant spring temperatures and no precipitation. After two years of rain, snow and no-go, the 2013 Ride for the Pass took off on schedule at 10 a.m. Saturday from the winter gate on Highway 82. Ten miles and 2,500 vertical feet later, the first finishers in the competitive division rolled across the line near the ghost town of Independence, barely 41 minutes after launch. And that’s where he stayed as Highway 82 turned up, up, up, along with the pace. Finally, the lead group was reduced to a trio: Carr, Wade Newsom and John Gaston. But he did, crossing in 41:21, two seconds ahead of Aspen’s Newsom. Gaston, a prominent ski mountaineer from Aspen, was third at 41:34. “I love this area. I love coming here to ride bikes in the summer,” Carr said, adding that he and his girlfriend decided to make an early trip to Aspen to take part in Saturday’s bike race. “Getting to ride Independence Pass with no cars is an amazing opportunity,” said Carr, who will celebrate his 30th birthday next month. He regularly trains on the famed climbs of the Front Range — Lookout Mountain near Golden and Flagstaff Mountain near Boulder. “This is a fun crowd to race with. It’s a fun, low-key group. Everyone rides hard, and they’re friendly,” said Carr, who also has raced in a few of the weekly Aspen Cycling Club races. Carr said he supplements his regular training with some high-elevation work in Summit County, where he travels on business. He also was first in the 20 to 29 age group for competitive men. Newsom was first in the 30 to 39 men’s category. Fourth overall went to Cormac McGeough, competing in the 11 to 19 age group. Adam McCurdy was fifth overall. Aspen endurance legend Anne Gonzales won the women’s competitive division for the umpteenth time Saturday, finishing 28th overall in 48 minutes, 50 seconds. The win was the closest of her illustrious career as Gonzales held off charging 14-year-old Hailey Swirbul by one second — one wheel length. “That’s probably the last time that I will be ahead of her, I’m sure,” Gonzales said of Swirbul, one of the top nordic skiers in the country. “She’ a tremendous athlete. I think she cycles to stay fit for her nordic skiing. That’s her passion. But if she ever changed her mind, she could have a long career in cycling,” Gonzales said, adding that Swirbul and her brother Keegan possess rare abilities for their ages. “To be able to push yourself past the hurt, at her age, that means she has something special,” said Gonzales, who is more than familiar with elite competition. “She has the ability and the mental capacity to keep it going,” Gonzales said of the young Aspen cross-country skier, who is on the U.S. Ski Team radar. “And she comes from a brilliant, sweet family. It’s a family thing they do with Hailey and her brother, Keegan. It’s a really great family,” Gonzales said. The biggest treat, Gonzales said, is the annual opportunity to ride Independence Pass with no vehicular traffic. “Riding the pass with no cars is great. The Ride for the Pass (Foundation) is a great organization. Whatever we can do to contribute, we will,” she said, echoing the sentiments of her pedaling colleagues. Riding in the recreational division, “means there’s no pressure. Just enjoy the ride, enjoy the scenery,” said Rosenstein, who works in Aspen. Tom Sulewski finished with the top time in the rec division (46:25), Ken McDonald was second (47:21). Connie Giles was first among rec women (1:00:17). Erica Purcell was second (1:00:31). He said the cyclists in the annual Ride for the Pass play a key role in work on Independence Pass. Complete results from Saturday’s Ride for the Pass will be available online at the Independence Foundation Pass website. Results also will be available at the Ute Mountaineer in downtown Aspen.